Monday 10am to 5pm; Tuesday 10am to 8pm; Wednesday 10am to 5pm; Thursday 10am to 8pm; Friday 10am to 5pm; Saturday 10am to 5pm; Sunday Closed. 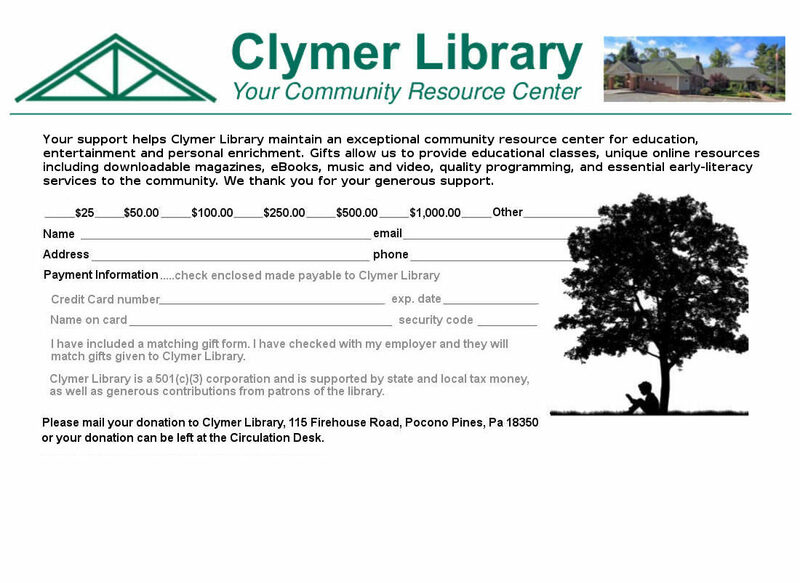 The Clymer Library will follow the winter weather schedule of the Pocono Mountain School District. If the PMSD is running on a 2 hour delay, the library will do its best to open on schedule. If the PMSD is closed, the library will also be closed. The Pocono Mountain School District announces its closings and delays on local television and radio. WNEP announces closings on television and on its website. Click here for WNEP’s School Closings & Delays. On the radio, you can listen for closing and delay information on 93.5 WSBG. Be sure to “like” our Facebook page and check it for additional information during any periods of bad weather. Safety is our priority for everyone. The Library is located on Firehouse Road in Pocono Pines about an eighth of a mile from the Tobyhanna Elementary Center and next to the Pocono Lake Cemetery. From Route 940 in Pocono Pines, turn onto Route 423 North near Gulf Oil. Turn left onto Firehouse Road. Clymer Library will be on the right.